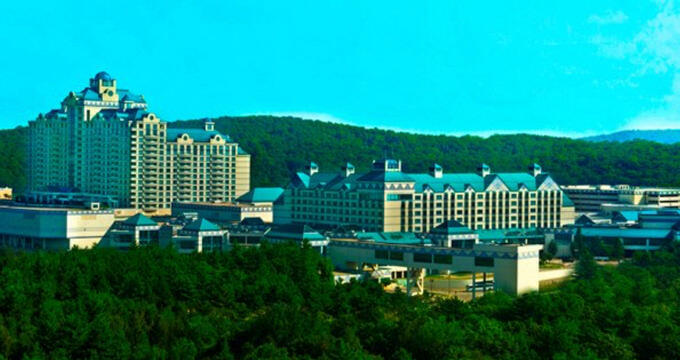 The Great Cedar Hotel puts guests steps away from some of the most popular gaming, dining, and entertainment the Foxwoods Resort Casino has to offer. Comfortable rooms and suites welcome guests for a restful night after a long day of play. Families will make memories sharing a meal at the Hard Rock Cafe Foxwoods, enjoying a treat from The Gelato Cafe, and battling against one another in a virtual reality adventure in the Great Cedar Concourse. Couples and friends can play a variety of slots and table games at the Great Cedar Casino, including the immersive PLAY Arena @ Foxwoods. Each 375-square-foot Deluxe Room comes with either one king-sized bed or two queen-sized beds, refrigerator, coffee maker, writing desk, vanity area, and combination bathtub and shower. The hotel’s 900 square-foot, one-bedroom suites include a king-sized bed, half bath, master bath with Jacuzzi tub and glass shower, and living room with entertainment center and bay window. The suites also include a wet bar with a refrigerator and coffee maker. At Cedars Steakhouse & Oyster Bar, guests can enjoy a raw oyster bar along with entrees featuring Maine lobster, local seafood, steak, and chicken. The steakhouse bar features several wide-screen TVs to watch the game over drinks and an appetizer. Located in the Rainmaker Casino, the Hard Rock Cafe Foxwoods offers classic American dishes in a rock-and-roll atmosphere, with a shop on site to take home Hard Rock Cafe apparel and collectibles. For dessert or an afternoon treat, The Gelato Cafe serves homemade Italian-style ice cream in a variety of flavors. The hotel also includes a Starbucks for a quick breakfast with signature hot and iced coffees and teas. The PLAY Arena @ Foxwoods in the Great Cedar Casino gives players access to all their favorite new and classic casino games in a single station, with customizable audio, lighting, and video settings. Next, to the Great Cedar Hotel, Rainmaker Stadium at the Rainmaker Casino features 30 multi-gaming play terminals and three live Blackjack and Mini-Baccarat dealers. Located in the hotel lobby, the Tree House Arcade features classic arcade games and pinball, as well as new interactive games and tickets redeemable for prizes. The Great Cedar Hotel also includes its pool located next to the hotel lobby. Hotel guests can take advantage of onsite shopping options, including Native Nations, featuring Native American jewelry, books and gifts, and Panache for fine jewelry and accessories. The Outpost offers everyday convenience and grooming products. Scenses features over 40 fragrances from Yankee Candle, as well as Crabtree and Evelyn products. The Fox Theater across from the Great Cedar Hotel shows a wide variety of acts and events, including nationally acclaimed comedians, circus and magic acts, TV game shows and live sporting events. Located in the Great Cedar Concourse, XD Dark Ride is a 7-D immersive gaming experience unlike any other attraction in the Northeast. Multi-sensory technology puts players right in the action of the game, with room for up to 8 players at once inside the full motion theater. Players can compete in a series of virtual adventures, including an intense zombie experience. For more virtual reality fun, the Heritage Racing Simulators use the latest technology to make players feel like they’re right on the race track driving Indy, NASCAR, and Formula 1 cars. Guests can take a break from all the action with a trip to one of the two spas at Foxwoods Resort Casino. Both the Norwich Spa at Foxwoods on the ninth floor of Grand Pequot Tower and the G Spa at The Fox Tower offers massages, facials, and body treatments as well as hair and nail services in the salon. Guests soak in the pool or whirlpool, relax in the sauna, or steam room, and take advantage of a variety of cardio and strength-training equipment in the fitness center. The Pequot Trails winding through the wooded hills around the resort offer another chance to slow things down. Starting in the Great Cedar Casino lobby, the Trails offer routes for both relaxed and moderate walks, including the Lantern Hill Trail with views looking out on Block Island Sound. The Trails provide a scenic route to the Mashantucket Pequot Museum & Research Center, a nonprofit institution part of the Mashantucket Pequot Tribal Nation. The museum features more than 300,000 square feet of permanent and temporary exhibits, as well as a 320-seat auditorium, classrooms, restaurant, and shop. Visitors can learn about the area’s natural and cultural history through films, archived materials, artifacts and traditional art and crafts from Native artisans.